A man has died in a diving accident in a flooded quarry. Paramedics were called to the National Dive Centre in Tidenham, Gloucestershire, on Thursday after the 52-year-old was pulled from the water. Gloucestershire Police said the man, from Great Yarmouth in Norfolk, was declared dead at the scene. An initial investigation has commenced with the police and the Health and Safety Executive on behalf of the coroner, a force spokesman said. "Our thoughts are with the man's family and friends following this tragic incident," he added. 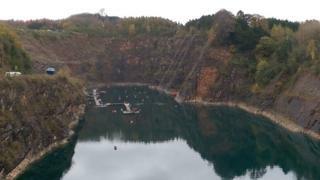 The former Dayhouse Quarry is the UK's deepest inland dive site, where people can swim to depths of 76m (249ft). The centre, which opened in 2003, is described as an inland scuba-diving site and is popular with technical and free divers.